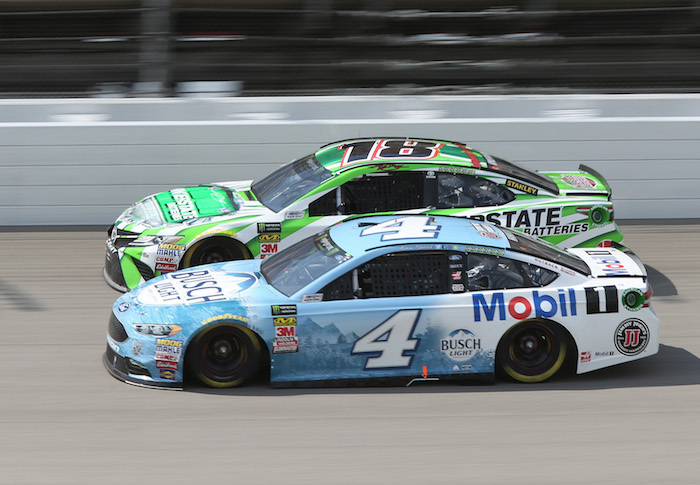 Kevin Harvick took the checkered flag in the Consumers Energy 400 at Michigan International Speedway in Brooklyn on Sunday for his seventh Monster Energy NASCAR Cup Series win of 2018. With his latest win, Harvick broke a tie he shared with Kyle Busch for most wins, 23 races into the season. Busch finished third behind Brad Keselowski. “We kind of clawed all day and had some good restarts with the Discount Tire Ford and got all we could get out of it but just ended up one spot short and that is so frustrating,” Keselowski said. After the race, Harvick’s son Keelan rode shotgun in the race car, carrying the checkered flag to victory lane. Harvick dominated the race, including the 80-lap third and final stage of the 200-lap race. He gave up the lead to pit during a green-flag cycle of pit stops on Lap 171. When the cycle completed on Lap 189, he regained his lead but reported that his engine was running hot. Austin Dillon, who was second to Harvick prior to the start of the only green-flag cycle of stops in the race, was second after taking two tires, but following being passed by Keselowski and Busch in the closing laps, he finished fourth. Harvick was the winner of both 60-lap stages that made up the first 120 laps of the race, collecting his 11th and 12th stage wins of the season. Front-row starters and Joe Gibbs Racing teammates Denny Hamlin and Busch led before a Lap 25 competition caution before Harvick took the lead on Lap 30 and remained up front for the remainder of the stage. Jimmie Johnson led two different times in the second stage, first at the start after a two-tire pit stop. He lost the lead to Busch on Lap 67, but he regained the top spot by staying out when the yellow flag waved on Lap 75. Martin Truex Jr. also stayed out during the caution and inherited the lead when Johnson headed to the pits during the next yellow on Lap 84. Harvick took the lead from Truex on Lap 110. Then, Truex went into fuel conservation mode. Truex ran out of fuel on the final lap of the second stage, and as a result, had to pit while pit road was closed. He received an additional penalty for an uncontrolled tire and went a lap down. He got back on the lead lap during a Lap 132 caution after Ty Dillon’s car hit the wall and caught fire as a result of hitting what looked to be the backup battery from another car. UP NEXT: The Monster Energy NASCAR Cup Series will go nighttime short-track racing Saturday night at Bristol Motor Speedway in Tennessee. The Bristol race will be the 24th round of the 26-race regular season. Kyle Busch is the defending winner of the August race at the track and also is the most recent Cup Series winner at Bristol, claiming one of his six 2018 season wins there in April.